Right in the middle of Covent Garden is the most magnificent church, I have never really paid much attention to it, but as of now I will look at it every time I walk past. It is a great venue to hold a Shakespeare play and adds to the whole production. Throughout the whole of July the Iris Theatre will be putting on the play of Julius Caesar – a historical and political blood-soaked play portraying the weakness of men. The play Julius Caesar is a play of revolution and rebellion, where senators Caius Cassius (Nick Howard-Brown) – who joins for selfish and jealous reasons and Marcus Brutus (David Hywel Baynes) – who joins for more of a balanced view of the political position and for his love of Rome. 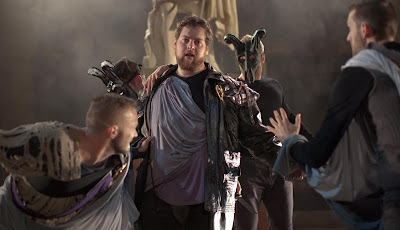 Their goal is to kill Caesar (Matthew Mellalieu) on the Ides of March (15th March). Having been successful in their goal, they are now being hunted by the fierce Mark Anthony and it is in battle that the majority of characters meet their untimely end. The Director Daniel Winder does an incredible job at making use of the space, with a long three hours to get through the job of keeping the audience entertained is proved a lot easier with moving around St Paul’s Church. Breaking up the long speeches and intense dialogue makes it easier to digest, it may be a great way for a younger audience to watch Shakespeare. There is also a great use of music, it is bringing a Shakespeare play in to the 21st Century you have to adapt to the audience and with the use of lighting, smoke and music this is achieved. The cast together work so effectively, with most of the cast playing multiple roles you don’t find yourself confused, as all cast are incredibly impressive. David Hywel Baynes who plays Brutus has countless opportunities to show off his incredible acting, with long dramatic speeches he adds passion, determination and authority all in to one impressive performance. With all Shakespeare plays there is a lot of death, and it just so happens in this production they are not lacking in the use of blood. As we leave the performance St Paul’s church walls are blood stained, the casts clothing are covered in blood. It’s also nice to see some over the top dying, a special mention to Nick Howard-Brown who wins on this night. As mentioned before the play is long and as the majority is being set outside so it is best you have a coat handy, cause as it gets past 10pm it does get quite chilly. I hope the weather holds out for each performance; thankfully it did for the one I watched. The night was a perfect setting for a Shakespeare play, with strong acting and a great story (thanks Shakespeare) it was a very entertaining evening. 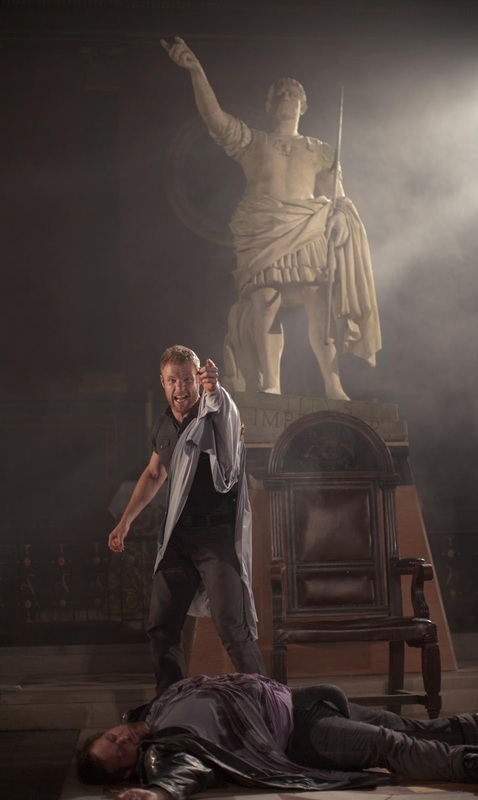 Julius Caesar runs at St Paul's Church until Friday 26th July 2013. Please visit www.iristheatre.com for further information and tickets.